"I love being DeafBlind and would not change it for the world." This collection of essays from one of the country’s leading voices on issues facing the signing community appears at a time of troubling trends and exciting new developments. 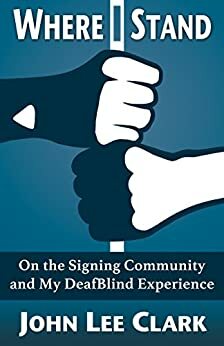 Through his lucid and accessible prose, John Lee Clark delves into questions ranging from why hearing parents of Deaf children don’t sign to how written American Sign Language will change the course of Deaf literature. As a second-generation DeafBlind man, Clark also takes us on a tour of his experiences as a student, father, husband, and “client” of special services. Filled with startling observations and unapologetic assertions, Where I Stand challenges and broadens readers’ understanding of an important but often overlooked community. "Disability is everywhere. It is, in fact, universal for to be human is to be disabled." "It's an exciting time to be DeafBlind."